Preston ended a four-game losing streak in the Championship with a comfortable win over already-relegated Ipswich. Nobody got this spot-on, but 19 did have the outcome. Norwich get a third draw in as many games thanks to 97th minute equaliser. Everybody predicted a win for Norwich except basher2010 who went for a 1-1. League One leaders Luton returned to winning ways as they easily beat 10-man Accrington. 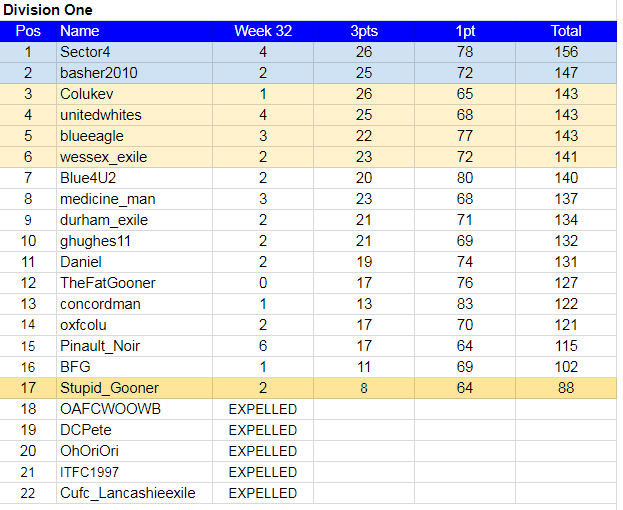 Just the 2 (TheHappyGooner and Pinault_Noir) got this spot-on, and another 22 had the outcome with 11 going for a 2-0 in what was the weeks most predicted score. Ash Hunter scored a 94th minute equaliser as Fleetwood salvaged a draw against Peterborough. That late goal was good news for the 5 who had this spot-on, and the 2 who got the outcome. 15 predicted a win for Peterborough. Ex U's Ian Henderson's 20th goal of the season kept Rochdale out of the relegation zone. 5 got this spot-on, and a further 11 had the outcome. A 94th-minute penalty rescued Walsall a draw with fellow strugglers Southend. That late equaliser was good news for the 8 who had this spot-on, and 4 more got the outcome. Cambridge all but confirmed their League Two place for next season with this bore draw against Swindon, who saw their play-off hopes dented as a result. Well done to durham_exile for being the only one to get this spot-on, and another 3 had the outcome. 17 predicted a win for Swindon. Colchester kept their League Two play-off hopes alive with a dominant win over Grimsby. 4 had this spot-on, and a further 19 got the outcome. Sol Campbell's Macclesfield saw their survival hopes dealt a blow with this defeat. Nobody got this spot-on, though 12 did have the outcome. Stevenage moved to within two points of League Two's play-off places with this comfortable win. Nobody had this spot-on, but 14 did get the outcome. Late goals in games is something that has occurred many times this season, and this week was another occasion when they made a big difference to the final outcomes, with seven of the ten fixtures having them. The Walsall equaliser had the biggest influence as nobody predicted a win for Southend, closely followed by Luton's third goal leaving the 11 who had predicted them to win 2-0 having to settle for a outcome. So those late goals produced winners and losers, but overall it was a pretty good week with 25 spot-ons in total, and 7 members managing to get double-figure scores. One member benefited in a big way with those late goals as TheFatGooner had the draws at Fleetwood and Walsall together with the Rochdale 1-0 spot-on, and four outcomes to make him the weeks top scorer with a brilliant 13 points. Another to benefit was Colukev as he also had the draws at Fleetwood and Walsall spot-on, and five outcomes, to give him an excellent 11 points. That excellent total was also achieved by Sector4, and he had the Walsall 1-1 and the Colchester 1-0 spot-on. Also getting 3 points for those same two scores was BFG on his way to a superb 10 points. Achieving that same superb score was sevebalo, who had the Fleetwood 1-1 and the Rochdale 1-0 spot-on, and unitedwhites who got 3 points for the Walsall 1-1 and the Rochdale 1-0. Finally basher2010 was the seventh member to get a double-figure score by coming out best of those to get one spot-on, the Fleetwood 1-1, and seven outcomes. Another superb effort to get his 10 points. In the Premier In what has been the closest Premier title for years, it took another twist this week when that superb effort - a fourth double-figure score this season - from sevebalo took him back to the top, with a useful 4 point cushion going into the final week. A loser on the late goal front was noah4x4, and he had to settle for five outcomes. I said last week that RSCOSWORTH would need more 3 pointers to give him any chance of a first title. Well he did get two, the Fleetwood 1-1 and the Colchester 1-0, but all it looks like achieving is guaranteeing him a Charity Shield spot, along with the top two. No other changes to positions this week, but at the bottom a decent score from eagledares has now made burnsieespana long odds on to join gsy163 in Division One next season. In Division One With the top four all getting double-figure scores things are very much as they were. What it does mean is Sector4 has all but confirmed the promotion that has looked on for a long time. A fourth double-figure score this season also for Colukev keeps him favourite for the other automatic spot. After a brilliant second-half to the season unitedwhites may just miss out on an auto spot but he is guaranteed a play-off place. As is basher2010 in what has already been a fantastic season for him by winning the Happy Cup, and Champions League and Charity Shield semi-finals to come. As for the other play-off spots things couldn't be any closer. Just the three outcomes this week has left blueeagle vulnerable, but he is still favourite for one of those spots. But the big news in this league is the brilliant score from TheFatGooner that took him up an incredible six places into that final play-off spot. The hard bit now will be staying there for the final week as there is only 3 points separating 6th to 11th. This could well be decided by first to post as it is that close. Congratulations to concordman on being the first to get 100 outcomes. But I am sure he would swap a batch of them for 3 pointers. At the bottom BFG continued with his good end of season form, and will be hopeful of retaining the Champions League title. As this is the last week of the season, and there is still plenty to play for in both Divisions, I would just like to say no more than four scores the same as your nearest opponent(s) please. Newcastle are winless in all 11 of their Premier League games against London sides this season after this latest defeat. 3 got this spot-on, and another 6 had the outcome. 16 predicted a win for Newcastle with 11 going for a 2-1 in what was equally the weeks most predicted score. Villa scored two goals in stoppage time to win a sixth straight Championship game. Nobody had this spot-on, but 18 did get the outcome with 11 going for a 2-1 in what was the weeks other most predicted score. Accrington ended a run of three defeats with this draw against their fellow strugglers, but could have won it if they hadn't missed a penalty. 4 got this spot-on, and 1 more had the outcome. 21 predicted a victory for Wimbledon with 10 going for a 2-0. Relegation-threatened Walsall sacked manager Dean Keates after 10-man Oxford virtually ensured their League One safety with this win. Nobody had this spot-on, though 8 did get the outcome. 10 predicted this game to end 1-1. The lovely Kurtis Guthrie scored twice to earn Stevenage this win - their first in four matches. Again nobody got 3 points from this game, but 6 did have the outcome. Lincoln took another giant step towards promotion as they extended their lead at the top of League Two to 11 points. Well done to Daniel for being the only one to have this spot-on, and another 10 got the outcome. A half decent week was turned into another one of struggle in a matter of minutes. 2-1 wins for Villa and Oxford would have given us another 18 spot-ons. But stoppage time goals from both put paid to that, and we had to settle for just the 8. They were shared out with 8 members getting one each, and we had a three-way tie for the honour of being the weeks top scorer, with the ones who had 3 outcomes. They were basher2010 and BFG, who both had the Wimbledon 1-1 spot-on, and Daniel, who had that good Lincoln 2-0 pick. To give them all got a very good 6 points. In the Premier Two outcomes for noah4x4 was enough for him to cling onto top spot, as by having the Palace 1-0 spot-on sevebalo reduced that lead to a single point. Going 1-1 all games looked promising for RSCOSWORTH, but late goals meant he had to settle for having just the Wimbledon 1-1. With only 26 games left to the season and a 13 point gap back to the fourth place, the Charity Shield spots are all but assured for the present top three. 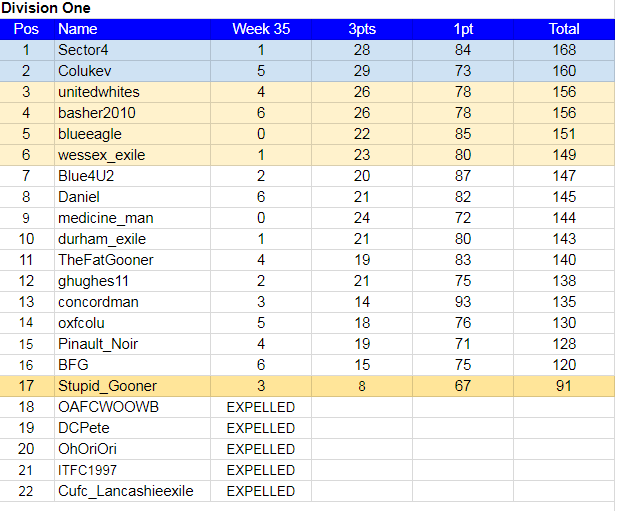 That fourth place is now occupied by TheHappyGooner who along with thrillseeker they both move up a place, in what is the only change in this division for the second week running. At the bottom burnsieespana did himself no favours by firing a blank, and he now has a battle to avoid the drop as eagledares takes advantage with his four outcomes. In Division One Just the one outcome for Sector4, but he still looks good for a top two finish. Going 1-2 all games for the second week running proved to be a good decision again for Colukev as it got him five outcomes, and it could have been a lot more if it wasn't for those late goals from Villa and Oxford. It will be interesting to see if he sticks with this strategy for the Week 36 fixtures. He maintains the other automatic spot, but the back to form duo unitedwhites with four outcomes, and basher2010 with his top scoring effort, stay well in contention for that place. They both look assured of a play-off spot if they fall short, but they other two spots are up for grabs, as Daniel with his top scoring effort is making a late bid to join the party. Further down the table BFG is having a good end of season as he top scores for the second time in the last three weeks. Week 36 Fixtures Lets have some "easy" fixtures for the last 6 game week of the season. A Pierre-Emile Hojbjerg goal improves Southampton's survival hopes. Just the 2 got this spot-on, and 2 also had the outcome. 18 predicted a win for Brighton. Burnley were another team to boost their hopes of Premier League survival with this win. Again 2 had this spot-on, and 2 also got the outcome. 17 predicted a victory for Wolves. Reading bring an end to Preston's 12-game unbeaten run. Yet again 2 got this spot-on, and 2 had the outcome. 20 predicted a win for Preston. Stoke recorded a fourth successive goalless draw in the Championship. Well done to Sector4 for being the only one to have this spot-on, and 6 more got the outcome. Luton take their unbeaten run to 27 with this hard fought victory. Well done to Colukev for being the only one to get this spot-on, but 24 did have the outcome. Rochdale remain in the League One relegation zone despite extending their unbeaten run to four games with this draw. There were 3 who had this spot-on, and nobody got the outcome. 20 predicted a Gillingham victory. The dominant Dons could even afford the luxury of an early penalty miss as they extended their unbeaten run on the road to five games. Only 2 got this spot-on, and 2 also had the outcome. 17 predicted a win for Scunthorpe. Colchester get a 96th minute winner to give them a deserved victory. A Colchester winner in added time. That is a real collectors piece. When did that last happen? Probably when Andy Bond got a stoppage time winner against Gillingham on August 3rd 2013. Surprisingly nobody had this spot-on, though 12 did get the outcome. Mansfield cruised to a comfortable win to keep alive their automatic promotion hopes and crush those of their woeful hosts. No surprise that nobody got this spot-on, but 5 did have the outcome. MK Dons get a 87th minute winner to keep their automatic-promotion ambitions on track as they dealt a body blow to Forest Green's play-off hopes. There were 3 who had this spot-on, and a further 8 got the outcome. Another big 10 game week that proved to be disappointing for point scoring, giving us our second worst 10 game week of the season so far. Many of the games had a well supported team, but it was only the weeks big banker Luton who produced the goods. Considering the number of surprise results a return of 16 spot-ons was a reasonable effort. It was certainly a inspirational decision by Colukev to go 1-2 all games, and he was rewarded with three spot-ons and three outcomes, to make him the weeks top scorer with a brilliant 12 points. Two members did well to have two 3 pointers. They were thrillseeker, who had the wins for Southampton and Wimbledon spot-on, and Sector4 who got the Reading 2-1 spot-on to go with his good Stoke bore draw pick, as they both got a decent 7 points. 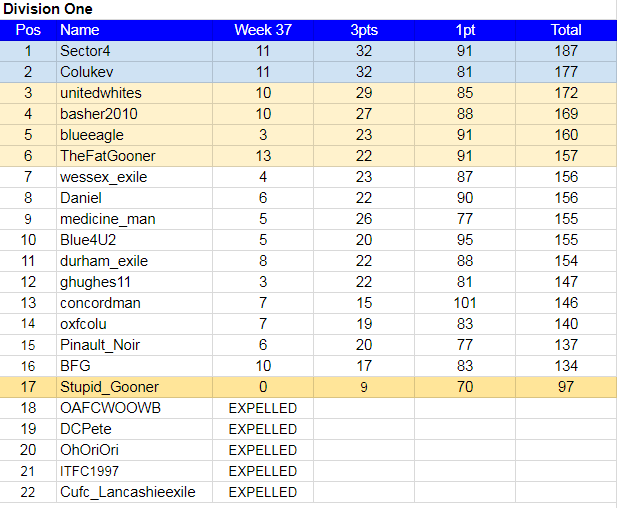 Best of those who had one 3 pointer was TheHappyGooner, who had the Gillingham 1-1 spot-on, and four outcomes to give them also a decent 7 points. In the Premier The top two had to settle for outcomes, and with noah4x4 winning that battle 3-2 he increases his lead over sevebalo by a point for the second week running. By having the MK Dons 2-1 spot-on RSCOSWORTH moved a point nearer the top, but that late Colchester winner robbed him of a vital 3 points with his bore draw prediction for that game. The only changes in this division saw thrillseeker and TheHappyGooner both move up a place with their decent scores. At the bottom gsy163 was another to benefit from having the Gillingham 1-1 spot-on, and he did reduce the deficit by a couple of points, but with only 32 games left to the season now relegation is still looking inevitable. In Division One Another decent week for Secto4 has now made him long odds on for an instant return to the Premier. It was just a one week stay for unitedwhites in the other automatic spot as that brilliant score from Colukev moved him four places to reclaim that spot he last held in Week 27. 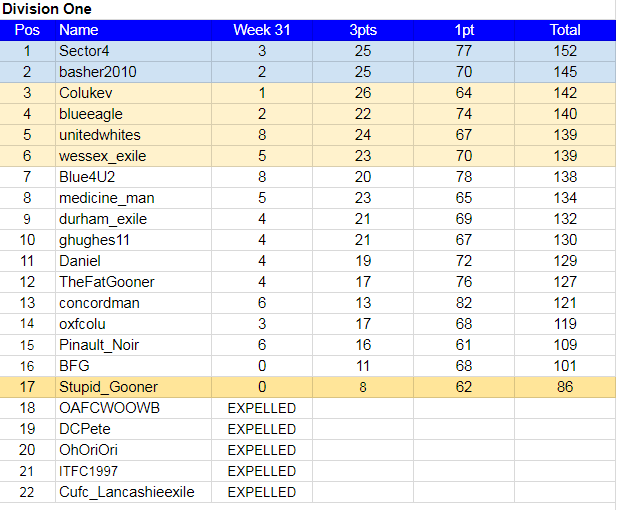 Just outcomes for the others in the the play-off places, and nobody outside those spots really took advantage, though medicine_man did move two points nearer thanks to having the Burnley 2-0 spot-on, but was another to lose a vital 3 points due to that late Colchester winner. League One leaders Luton made it 26 games unbeaten with a thumping victory over play-off hopefuls Doncaster. Nobody got this spot-on, but 23 did have the outcome. Promotion-chasing Portsmouth climbed to third in League One with victory at relegation-threatened Shrewsbury. A decent 6 had this spot-on, and a further 16 got the outcome. Luke Varney's double and a goal from Tyrone Barnett secured an emphatic League Two home win for Cheltenham. Nobody got this spot-on, though 5 did have the outcome. Lincoln extended their unbeaten run to 16 games with this comfortable victory. Well done to BFG for being the only one to have this spot-on, and another 22 got the outcome, with 11 going for a 2-0 in what was the weeks most predicted score. Bury's League Two title hopes were dealt a blow as they were held in an entertaining goalless draw. Again no 3 pointer for anybody, but 5 did have the outcome. The other 20 predicted a win for Bury. Mansfield Town dropped out of the League Two automatic promotion places after this shock defeat. 22 predicted a win for Mansfield, and the other 3 went for a draw. So no points for anybody here. Swindon thrashed Morecambe to boost their League Two play-off hopes. Not surprisingly another game without a 3 pointer, though 16 did have the outcome. The other time we had a 7 game week this season it produced 39 spot-ons, but that was never going to happen this week with that set of results. It looked promising when Luton and Lincoln were both winning 2-0, but late goals from them put paid to that. In the end it was only Portsmouth who saved it from being an almost barren week for 3 pointers, though the 87 outcomes did guarantee points for everybody. With only two games having a 3 pointer it was great effort from BFG to be the only one to have them both, and with two outcomes he is this weeks top scorer with a decent 8 points. Best of those who had one 3 pointer was unitedwhites with four outcomes to go with the Portsmouth 2-0 spot-on, giving him a very good 7 points. In the Premier By having the Portsmouth 2-0 spot-on noah4x4 increased his lead by a point as the five outcomes from sevebalo made sure it wasn't any more than that. Another to benefit from that Portsmouth 2-0 was RSCOSWORTH, as he enhanced his Charity Shield spot. The title now seems to rest between those three. With the next five positions all scoring 4 or 5, the only change had TheHappyGooner moving up a place with their five outcomes. At the bottom, only a few weeks ago it was any two from seven for the relegation places, but now with a 6 point gap between 8th and 9th it is looking more like any two from three now, though with only 42 games left to the season gsy163 is going to require some double-figure scores to stand any chance of surviving. In Division One Four outcomes from Sector4 helped him to also increase his lead by a point, but that is now from a new member in the other automatic spot. After Week 21 unitedwhites was 29 points from the automatic spots, and only had four members below him. At that stage it looked a forlorn hope of even a play-off spot. Since then he has produced what must be one of the most incredible turnaround of form in Happy League history, and another decent week has moved him up into that auto spot. The hard bit now could be staying there. Five outcomes moved blueeagle up a place, and four outcomes moved wessex_exile up a place also as they both took advantage of a no show from Colukev that has left him clinging onto a play-off place. The rest of this league saw no change, but it was good to see BFG show some of his Champions League form with a top scoring effort. Kyle Edwards scored a stunning solo goal on his first league start for West Brom to ensure victory for the promotion chasers. Surprisingly nobody got this spot-on, but 13 did have the outcome. Sean Maguire struck a 94th minute winner as Preston extended their unbeaten run to 12 matches. That very late Preston goal was good news for 3 who had this spot-on, and a further 19 got the outcome, with 11 going for a 2-1 in what was the weeks most predicted result. This comfortable victory was a first home win in 2019 for Burton. Nobody got this spot-on, though 9 did have the outcome. Coventry closed in on the League One play-off places with victory at their fellow promotion chasers. Nobody had this spot-on, and only 2 got the outcome. Two first-half goals gave Macclesfield a much needed League Two win against their fellow strugglers. Well done to Pinault_Noir for being the only one to have this spot-on, and another 5 got the outcome. With the Oldham fixture being called off this became a five game week, and one that would have been a complete disaster for most members if it wasn't for that late Preston winner. That goal saved eight members from firing a blank, and turned it from being a disaster into just a very tough one. Three members got that Preston win spot-on, but it was the member who had the weeks only other 3 pointer who is this weeks top scorer. That being Pinault_Noir with his good Macclesfield 2-0 pick, and by also having three outcomes he got a very good 6 points to claim that honour. In the Premier That late Preston winner saved the top two from firing blanks, and by getting it spot-on sevebalo reduced the noah4x4 lead by two points. That was the only 3 pointer achieved by anybody in this division, though mfb_cufc did get four outcomes that means he now has more of them than anybody in both divisions. But they have only made sure he is not in the relegation zone, as a lack of 3 pointers has made a top three finish very unlikely. The only changes this week saw thrillseeker and TheHappyGooner both move up a place with their three outcomes. At the bottom, with only 49 games left to the season, it is looking like the two season stay in the Premier is coming to an end for gsy163. In Division One By having that Preston 1-0 spot-on Sector4 increased his lead by a couple of points, and is now looking good for an instant return to the Premier again. As for the other automatic spot basher2010 remains slight favourite with his 4 point cushion. On such a low scoring week the only change in this league had unitedwhites moving up a place as he continued his hot second-half season form by being the other one to have the Preston 1-0 spot-on. Week 33 will now be a 7 game week to make up for the Oldham fixture we lost this week. Week 33 Fixtures It is International break time again so lets go to town with 7 fixtures from Leagues 1 & 2. Bolton put their off-field issues to one side to overcome a Millwall team who have now lost their last four games. 3 got this spot-on, and another 6 had the outcome. Patrick Bamford scored his fourth goal in as many games as Leeds maintained their push for automatic promotion. Well done to noah4x4 for being the only one to have this spot-on, and 12 more got the outcome. Wednesday have yet to be beaten since Steve Bruce took over as manager eight games ago. Just the 2 (RSCOSWORTH and TheHappyGooner) got this spot-on, with another 1 having the outcome. 20 predicted a win for Derby. Brentford scored twice in three second-half minutes for a stunning comeback victory which dents Middlesbrough's fading automatic promotion chances and keeps alive their own Championship play-off hopes. No points for anybody here. 25 predicted a win for Middlesbrough with 13 going for a 2-0 in what was the weeks most predicted score. Forest had lost their past five home league matches against Hull, but they brought an end to that run with 3 goals in the last 18 minutes. Nobody got this spot-on, but 14 did have the outcome. Stoke frustrated QPR as both sides finished with 10 men in this bore draw. Again nobody had this spot-on, though 4 did get the outcome. Reading came from behind to get a dramatic 97th minute winner. Yet another game with no 3 pointers, but 14 did have the outcome. West Brom make it 6 home games without a win as they are held by their League 1 bound opponents, in what proved to be head coach Darren Moore's final match in charge. Everybody predicted a win for West Brom. Former U's loanee Brandon Hanlan's fifth goal of the season in the 89th minute wins it for Gillingham. That late victory was good news for the 6 who got this spot-on, and the 10 who had the outcome. Lyle Taylor grabbed his 13th League One goal of the season to earn a vital victory for Charlton against their promotion rivals. 5 had this spot-on, and 3 more got the outcome. This was the first one of the four big 10 game weeks left in the season, and it turned out to be overall disappointing, with the eight games from the Championship only producing 6 spot-ons, but the two League 1 games achieved another 11 between them, to put some sort of respectability to proceedings. But this was still the second worst 10 game week of the season so far, only beaten by the previous one in Week 28. Despite that three members did well to have two 3 pointers each, with noah4x4 leading the way by having the wins for Leeds and Charlton spot-on, and with four outcomes, he is the weeks top scorer with an excellent 10 points. The third time this season he has got a double-figure score. Others to get two spot-on were unitedwhites, who had the wins for Gillingham and Charlton, and Blue4U2, who had the wins for Bolton and Gillingham, as they both got a very decent 8 points. The Happy Cup Final is next weekend, and basher2010 has already posted his predictions. Just waiting for ghughes11 to post his now with a reminder the deadline is Saturday 12.15. In the Premier The big news here is that we have a new leader with the excellent top scoring week from noah4x4 taking him back to the summit for the first time since Week 1, and brought an end to the sevebalo 19 week reign at the top. As for the rest of the division it is very much as you were, with the only change being thrillseeker moving up a couple of places thanks to having the Bolton 2-1 spot-on. In Division One With the top four all relying on outcomes Sector4 was able to increase his lead by a point. But it is the other two occupying the play-off spots, unitedwhites and wessex_exile who both continued their tremendous second-half season form to greatly enhance their automatic hopes. Also well in contention for at least a play-off place is Blue4U2 after his decent week. Just like the Premier it is as you were for the rest of the league, with the only change being concordman moving up a place after getting a spot-on for the second week running - the Gillingham 1-0 - but his play-off hopes were not improved. Four first-half goals win it for Villa, as they thumped a dire Derby who didn't have a shot on target. Nobody got this spot-on, but 8 did have the outcome. Stoke end their six-game winless run, as they put a dent in the Forest play-off hopes. Well done to Daniel for being the only one to have this spot-on, and 5 more got the outcome. 16 predicted a win for Forest. Jonson Clarke-Harris netted a hat-trick as Rovers boosted their League One survival hopes. Nobody got this spot-on, though 9 did have the outcome. 17 predicted a victory for Blackpool. Oxford earn a vital 3 points in their bid to avoid the drop from League 1. A 92nd minute goal from Scunthorpe was good news for the 5 who had this spot-on, and another 12 got the outcome. John Akinde's brace cemented Lincoln City's grip at the top of League Two . A massive 10 got this spot-on, in what was the weeks most predicted score, and a further 10 had the outcome. County were forced to settle for a point in their crunch relegation clash in a game of few chances. Nobody had this spot-on, but 6 did get the outcome. 16 predicted a win for County. Another tough week to add to the many we have had this season. At least the 2-1 wins for Oxford and Lincoln helped to give a reasonable return of 16 spot-ons, and it was the two members who got 3 points for both of them who were the top performers this week. They were Colukev, who also had 3 outcomes to make him the weeks top scorer with an excellent 9 points, and basher2010, who just missed out on that honour, with a superb 8 points. Best of those who had one 3 pointer were sevebalo, Sector4 and Daniel who all got a decent 6 points. Double-figure scores After looking at the rather negative Firing blanks last week I thought it would be good to balance things up by looking at the number of double-figure scores members have had in the five seasons of my administration, and also the highest score achieved in that time. It has come up with an interesting stat that the ones top of each division are currently heading their leagues this season as well. In the Premier The top three all benefited from having the Lincoln 2-1 spot-on, but sevebalo came out best on the outcomes, and increased his lead over noah4x4 by a point, who in turn pulled two points clear of RSCOSWORTH. In a clear fourth remains Tropical_Us, as the other seven continue to be more concerned with being relegated than obtaining a Charity Shield spot. By having the Oxford 2-1 spot-on mfb_cufc heads that pack of seven, but by firing his first blank of the season burnsieespana drops back into the final relegation place again. With only 64 games left to the season gsy163 now has a mountain to climb to avoid the drop. In Division One By going a blind 2-1 all games Sector4 would be pleased with a return of 6 points, but the excellent weeks for his nearest pursuers basher2010 and Colukev - who moved back to third - continue to put pressure on him getting an automatic spot. Three outcomes for blueeagle keeps him in contention for the auto's, as he continues to do best of the newbies. This is another week where things remained much the same in the rest of the league, but the good Stoke 2-0 pick moved Daniel up a place, but more significantly 2 points nearer to the play-offs. After going 8 weeks without a 3 pointer concordman finally got one courtesy of the Lincoln 2-1, but by failing to add to his excellent haul of outcomes, didn't really improve his position. The winner will get a personalised Colchester United mug, and of course a place in the Charity Shield semi-finals. Final Fixtures These are the four FA Cup quarter-finals fixtures played at different times on the Saturday and Sunday, and six from the League on Saturday. These are one off games no replays. The usual tie-breaker rules apply, most 3 pointers, and then more importantly the first to post. Finally, no more than four scores the same as your opponent please. All 10 games to be predicted at the same time please. In a game of three dubious penalties, both teams score one and Bournemouth miss one. The 6 who got this spot-on will be pleased about that miss, and the 2 who had the outcome. Said Benrahma starred with his first Brentford hat-trick as they came from behind to secure their sixth straight home victory in style. Nobody had this spot-on, but 20 did get the outcome, with 12 going for a 2-1 in what was the weeks most predicted score. Preston scored three goals in the opening 27 minutes to extend their unbeaten run to eight games. Again nobody got this spot-on, though 11 did have the outcome. Rotherham salvaged a late point against their fellow Championship strugglers. A massive 9 had this spot-on, and another 2 got the outcome. Portsmouth miss a penalty to make it eight games without a win, as Barnsley extend their unbeaten run to fourteen games with this bore draw. Nobody got this spot-on, but 7 did have the outcome. Grimsby came from behind with 10 men to force a draw. 5 had this spot-on, and nobody got the outcome. There were 18 who predicted a win for Swindon. An incredible week with late goals in the games at Bournemouth, Reading and Swindon giving us three one all draws for the third week running. 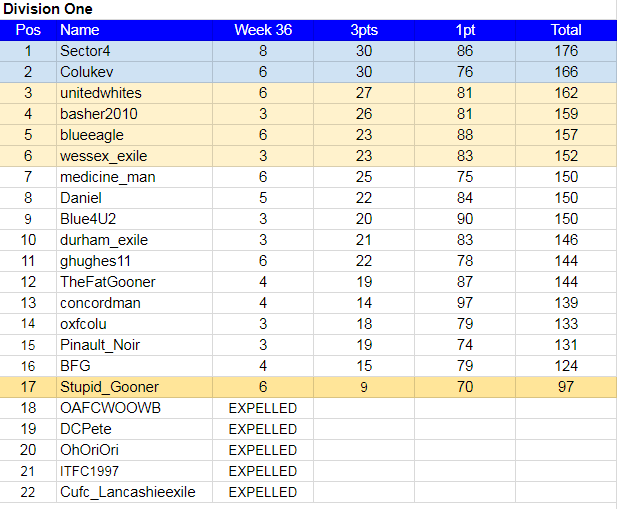 They also gave us our only spot-ons this week, so it turned out to be a great decision by TheHappyGooner to go 1-1 all games, and they are this weeks top scorers with an excellent 10 points. Also benefiting from going 1-1 for five games is RSCOSWORTH, and though disappointed to miss out on the Swindon game, he will still be pleased with his decent 7 points. Also getting a decent 7 points was burnsieespana, that included having the draws at Reading and Swindon spot-on. Best of those who had one 3 pointer was gerry_us, who had the Bournemouth draw spot-on, to help him get a very good 6 points. Next week, on a more positive note, I will show how many double figure scores everybody has had in my time of administrating. In the Premier By having the Swindon 1-1 spot-on, with a very rare draw prediction, noah4x4 has cut the sevebalo lead down to just 2 points. The decent week for RSCOSWORTH enabled him to close in on the top two, and a solid week for Tropical_us leaves him in a clear fourth place. As for the rest of the division, well they are now all involved in a relegation scrap after the good weeks for burnsieespana and TheHappyGooner has taken them up into the pack above them. As we go into final quarter of the season it couldn't be any closer to avoid those two relegation places with only 3 points separating 5th to 10th. In Division One A quiet week in this league with nobody getting more than one 3 pointer, but with the Sector4 blind 2-1 picks only getting him 1 point, the pack took the chance to close in, and has suddenly left him vulnerable for an automatic spot. Reclaiming the other automatic spot is basher2010, but only on the most 3 pointer rule. There was little change in the rest of the league, with most significant one being unitedwhites moving back into a play-off place.